The Baker’s Catalog came. Everything stops around here when the Baker’s Catalog comes from The King Arthur Flour folks. I read it cover to cover. In it was a recipe for “Pink Lemonade Cake”. I thought, “Yay! Perfect! I grow Pink Lemonade Lemons so I’ll make the cake.” Then I read the ingredients and realized that the cake’s color came from food coloring and it even used some powdered lemon juice which I didn’t have (or need, since I grow Pink Lemonade lemons). I wanted to use fresh pink lemonade lemon juice which is a slightly paler pink than a Ruby grapefruit and not use food coloring (per se) so I rummaged around my cookbook baking shelves and this is the delicious (alas, not pink in color) result. 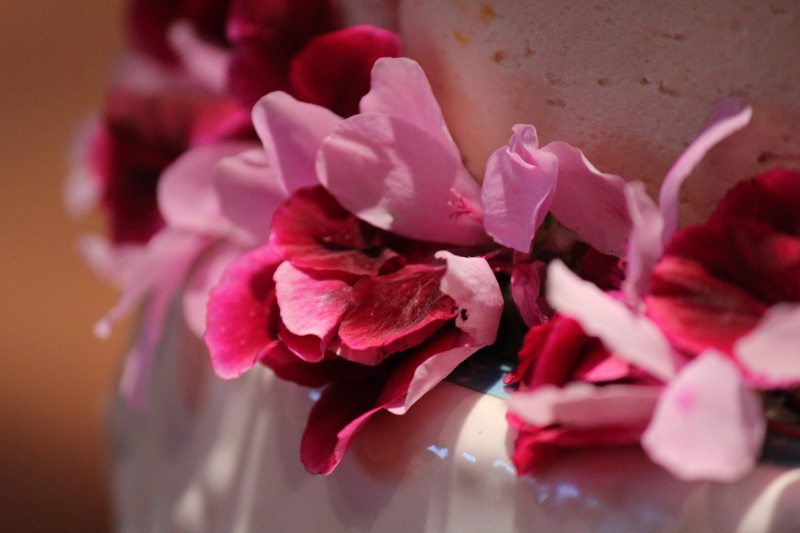 You can clearly see in the photo above that my cake is not pink like the inspiration cake. Drats! Here is a photo of a “Pink Lemonade” Lemon on my tree. 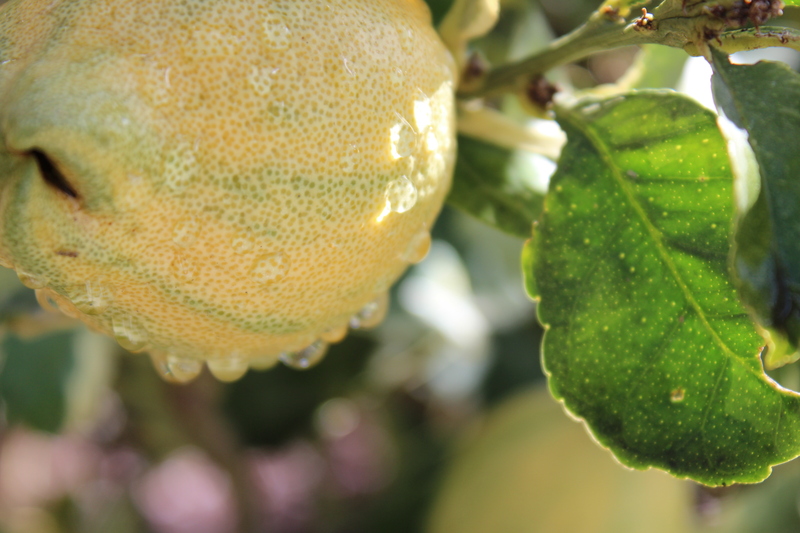 Pink Lemonade lemons are variegated green and yellow until they are ripe when the rind becomes completely yellow. It is very handy to know which fruits on the tree are ready for harvest since this tree is like the Meyer Lemon tree in that it has both immature and mature fruit, as well as blossoms on the tree at the same time year-round. It differs from a Eureka lemon tree which blossoms once a year and then sets fruit all maturing at the same time. The leaves on the Pink Lemonade tree are also variegated green and white and have a lovely lemon fragrance. I sometimes use the leaves similarly to Kaffir lime leaves in food. Heat the oven to 350 – 375 degrees F.
In the bowl of a mixer, add the lemon and orange zest to the butter and cream thoroughly; add sugar gradually, and cream together until light and fluffy. Add the eggs, one at a time, beating thoroughly after each addition. Add the sifted flour mix, alternating with the fruit juices and water, a small amount at a time. Beat after each addition until smooth. Pour batter evenly into two 8 or 9-inch round cake pans that have been buttered, then lined with parchment paper, and then the parchment paper has been buttered as well, and bake at 350 -375 degrees F. for 20 – 30 minutes or until done. Use a toothpick inserted in the center of the cake layers that comes out clean (no wet batter clinging to the pick) to test for doneness. Cool in the pans 10 minutes and then remove the cakes from the pans and put on a wire rack until completely cool. Frost when cool. Add orange zest to the butter; cream well. Add part of the sugar gradually, blending after each addition. Combine lemon juice and water; add to creamed mixture alternately with remaining sugar and salt, until smooth and of the right consistency to spread. Makes enough frosting to cover the tops and sides a 9-inch two layer cake. Posted in Recipes - from Karen England - Edgehill Herb Farm, Uncategorized. Tagged Baking, Blood Oranges, Cake, Citrus, dessert, food, Frosting, Homegrown Blueberries, king arthur flour, meyer lemon tree, Pink Lemonade lemons, ruby grapefruit, Sifting, Wychwood Scented Geranium. 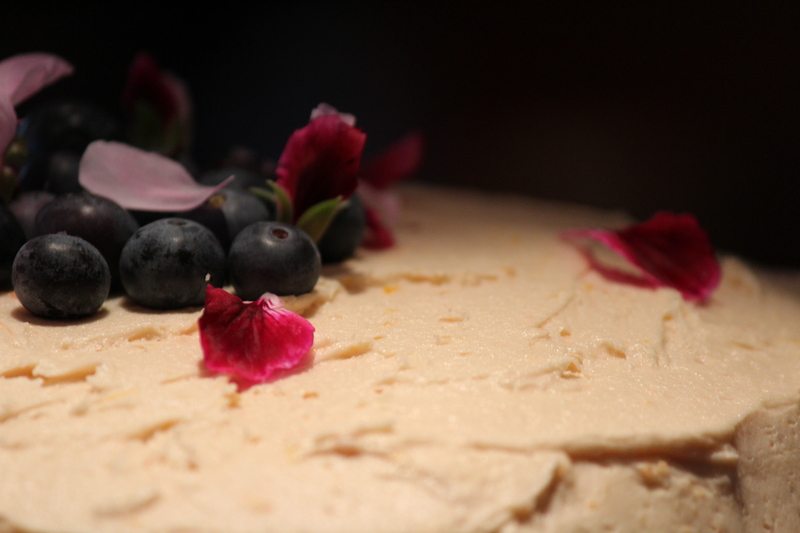 Just looked at your link to the inspiration cake – I like yours better, much prettier and natural!!!! Awwwww! Blushing (pink, of course!) Thanks Katydid! Oh wow! What a lovely post. I have to bake a birthday cake today so you’ve inspired me to go check my tree for lemons! Thank you.